I love herons. Their elegance: long, lean, streamlined curves over water, poised, waiting. Their focus: totally in the moment, poised, waiting….to strike sharp and swift. I love their languid flight: long wings lazily beating, slow concentrated strength and grace. We live in Glasgow, Scotland – UK city with the most green space. Our flat overlooks the river Kelvin which flows through the West End’s Botanic Gardens. On the riverbank, throughout the Gardens, all kinds of wildlife abound: amongst the over-fed pigeons and importunate grey squirrels the occasional kingfisher, an otter once seen on Boxing Day, sometimes a cormorant or two – and several herons taking up favourite positions along the river bank. The fish ladder by the weir is a choice spot of theirs. Another pitch is partly concealed by vegetation, right below the Humpbacked Bridge leading to steep steps rising to the upper, more cultivated part of the Botanic Gardens. Most days, I take a well-travelled route down from our house – crossing the Humpbacked Bridge, up the steps, through the Botanics past the Kibble Palace. This splendid circular, domed Victorian glass house hosts fine sculptures, elegant glass panels, a well-stocked pond – with some very old fishy friends adept at dodging the coins and wishes raining down on them on a regular basis – and a wonderfully displayed selection of plants and flowers from many parts of the world. It is a local jewel. Strolling around those familiar, well-loved landmarks, I always enjoy occasional sightings of the heron. 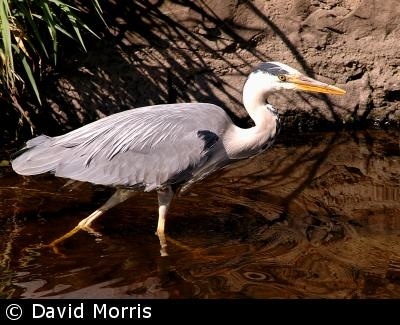 We can never decide how many herons there are of the same age and appearance. Maybe we are seeing the same one, over and over? Conversations like this weave together a very disparate, loose group of park regulars of all ages with a variety of views and opinions about the Botanic Gardens’ wild creatures. 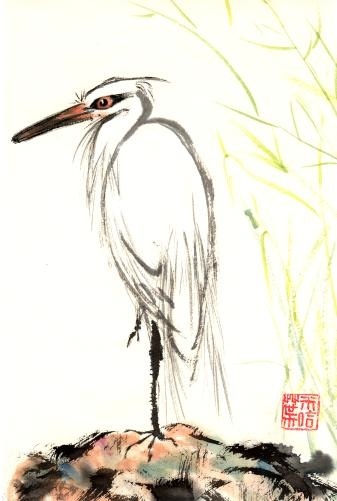 But the heron is a favourite; we always report sightings to one another. We are inured to plentiful rain and bad weather as the default position for our local climate; stepping out into a pleasant, crisp, sunny morning is therefore an immediate delight, especially with the Botanics in full autumn colours, carpets of leaves everywhere – if you get out early enough, before the park attendants with their noisy leaf-blowing machines get going! Whilst appreciating this beautiful autumnal morning, my head was also full of the usual thought traffic as I contemplated the day ahead. The Buddhists speak the truth: we are only ever partly here. In each waking moment of our short, precious lives, we are usually distracted by something or other from being fully present. Thus we rarely savour fully the Holy Dharma of this very moment which will never come again. Suddenly, my attention was totally focused on a sight I had never seen before. The heron was perched in full view, half way along the left-hand side of the Humpbacked Bridge! I stopped dead. Most unusually at half past nine on a weekday morning, there was no-one in sight. “Should I stay watching right here, or try to creep closer?” I wondered, full of excitement and apprehension. Deciding on the latter option, I tiptoed very very slowly onto the eight-foot wide bridge, veering to the right in order to edge along the opposite side of the bridge to the heron. The wild creature seemed absorbed in his own surveillance operation, long elegant neck moving slowly from side to side, eyes glinting in the morning light reflected off the quietly flowing river. Whether he had spotted me or not, he was paying me no attention. Barely able to believe my luck, I inched along extremely quietly until – to my great amazement – I was level. We were only a bridge width apart. Never in my life before had I been so close to such a large wild bird. The morning was still. The heron, briefly, was still. I was still. The Holy Dharma moved with the air currents across the bridge, the heron and me. All was One. Hours might have passed. It was probably less than a minute. I caught a flicker of movement out of the corner of my left eye. A slender young man dressed all in black, carrying a rucksack, i-pods in his ears, was rapidly approaching the bridge. Stealthily, I crept forward a couple of feet, heading off the bridge toward the steps, still hugging the side opposite the heron. He still didn’t budge. For a fleeting moment I thought “Anne, that wild creature is tuned to you. He can feel your goodwill….” Then the rationalist dismissed such a thought. Still…. The young man was about to step through the gate onto the bridge. I held my finger to my lips, indicating silence; with my other hand palm up, I signalled to stop, waving him over to my side of the bridge – hoping this unknown young man might share a rare experience. But he ignored me. As he marched past us the heron took off, winging his lazy languid way downriver. Waving goodbye, I stood for a moment – partly watching the heron, partly watching the young man’s back as he tramped up the stairs. In that moment I truly felt the force of life’s duality: on the one hand, such gratitude and joy that the heron and I had shared a pure, holy moment of Oneness. On the other, deep sadness that the young man, shut in with his technology, had missed it. Carl Jung’s comment, which comes to me often, came to me then: “Our task in this life is to reconcile the opposites”…..
….and a ps to this story….a couple of weeks later, I was strolling home through the Botanics by the river Kelvin on my way home, having spent the afternoon at my office writing the first draft of this article which was in my bag.There on the riverbank, in places where I had never seen them before, were – to my amazement and delight – two herons…. I found out tonight from the Big Island Chronicle (Hawaii) which published a link from my blog yesterday, that the great Buddhist teacher Bo Lozoff died in a car crash on 29th November 2012. This post featuring Bo’s wisdom, is republished in his honour. Pema Chodron’s “When things fall apart”, Jack Kornfield’s “After the ecstasy, the laundry”, (see Book Reviews page for review of this great book) and Bo Lozoff’s“It’s a great life – it just takes practice”. “Anything that can happen to anyone at any time can happen to me, and I accept this”. He keeps this meditative thread running through days of allowing fantasies of the worst things that could devastate him, and those he loves, to rise and dissolve. At the end of the retreat he goes home, more at peace with the realisation that chaos can and does arise at any time to sweep away the order of our personal and collective lives. Bo Lozoff is now in his sixties. His spiritual journey began at the age of eighteen. A typical self-absorbed materialistic American teenager (his own description) driving home late one night, a momentary lapse of concentration caused him to crash into a lorry and smash himself to bits. In essence, the Buddhist view is that suffering is caused by wishing for things to be other than they are. I found reference to this simple, penetrating piece of wisdom – prominently displayed in our kitchen – bracingly therapeutic during my long period of recovering my energy, especially at times when self-pity threatened to take me over. Life requires both chaos and order. With chaos alone, nothing could take form. Order by itself shuts down creativity and ultimately life itself. Chaos and order interpenetrate at every level from the most trivial to the most profound. Most of us who are at all computer-literate have at least once had the experience, early on, of pressing the wrong key or clicking the wrong box – sending our beautifully ordered and pleasing words which we haven’t backed up, into the void. And I know of hillwalkers who, slipping in the wrong place, fell to their deaths throwing loved ones’ lives into chaos in seconds. How do we cope with this ? Buddhism advises us to hold very lightly to order, knowing it can turn at a blink to chaos; and to walk into chaos, regarding it as ‘very good news’ in the challenging words of renowned teacher Chogyam Trungpa. Clinging to outdated structures whilst the storms of life are tearing down everything familiar, usually doesn’t work. ‘Leaning into the sharp points’, trying to face and learn from upheaval, is a more fruitful strategy. But its rewards may take time to become evident, and it can be very hard to find the trust that new order will eventually emerge. At an ordinary day-to day level, the key to coping well with the ever-changing energy pattern of life is cultivating the ability to live in the present moment. “Carpe diem” as the Roman poet Horace famously said in his Odes : “seize the day”. Now is all we’re sure of. Let’s live it fully! Then unfolds the long, possibly very varied route culminating eventually in a return to the ground where the journey began. In the summer of 2005 my husband and I began attending our local Episcopal church – now it feels very much like home territory. For this entirely unexpected turn of events, I hold the Dalai Lama at least partly responsible! In the process of extensively reading and benefiting from Buddhist wisdom, via inspirational Buddhist teachers including Jack Kornfield, Joseph Goldstein and Pema Chodron, I came across a comment from His Holiness to the effect that if one could find a corner in one’s own tradition, why adopt anyone else’s? After reflecting on this observation for a long while, I concluded that the Dalai Lama was right. Thus, after a lengthy and complex spiritual quest, I found a spiritual home – open enough to accommodate my belief that all Gods are One – a mere fifteen minutes’ walk from our house. Since this return to Christian roots, I have been reflecting on whether, over the years, there has been a particular setting to which my soul usually returned to find peace and sustenance. In the absence of Church, what provided a context for the longing for the Sacred? For me it was the sea. I was born by the sea. The stripped-down Presbyterianism of my native Hebridean island certainly spoke eloquently to many, but did not speak to my Romantic temperament: it was a form of worship too spare and verbal for a soul whose longing for the Divine needs the engagement of all the senses. Since attending the Episcopal church, I have often been struck by the evocatory similarities which exist between experiences of Church and of the sea. The most obvious is the stimulation of the five senses, opening one up to a feeling of union. The serene grace of the ‘liturgical dance’ within a beautiful, atmospheric building saturated with prayer and flooded (on a good day!) with colour from vibrant stained glass windows, can be quite overwhelming. Then there is the heady scent of incense, the rich sound of choir and organ, the physicality and friendship of touching others familiar and unknown through the sharing of the peace and the sharing of the Eucharist. The remote beaches of the Hebrides are also perfect for communing. In some places no mark of human hand can be seen anywhere. You could be in any epoch. The endless ebb and flow which soothes your spirit is millions of years old. With the cries of wild birds, and the sound of the wind ( no shortage of that !) the sea weaves music which carries you beyond time. The rich smell of ozone, salt and bladder-wrack is overlaid with a delicate scent of wild flowers. Sea splashes leave salt tastes on your skin. Sunlight on the sea’s surface creates diamond sparks. God is right here. Natural beauty calls to us, confirming that the Holy Spirit which we sense in nature includes us all. Sand, sea, sun and solitude evoke a sense of our infinite smallness in relation to the vastness before us. Yet there could be no sea without each drop of water, no beach without each grain of sand. Church on the face of it is very different, being a contained space. But it is a space charged up with collective worship, where the cadences of liturgy and participatory ritual also evoke a feeling of God’s vast presence in relation to our precious smallness. The mind-calming, meditative facets of sea, and centuries-old church ritual, can lull us into peace, calming the heart and uplifting the spirit. Both sea and Church in their differing ways can restore a sense of the balance and interweaving of matter and spirit – “spirit is a lighter form of matter, matter is a denser form of spirit” – and provide a reminder that the small, limited, mundane world which we inhabit is set to the compass of Eternity. Most days, I take a well-travelled route down from our house – crossing the Humpbacked Bridge, up the steps, through the Botanics past the newly-refurbished Kibble Palace. This splendid circular, domed Victorian glass house hosts fine sculptures, elegant glass panels, a well-stocked pond – with some very old fishy friends adept at dodging the coins and wishes raining down on them on a regular basis – and a wonderfully displayed selection of plants and flowers from many parts of the world. It is a local jewel. I’ll tell you why. Because normal and ordinary and energetic feel like gifts. Having a normal body, doing ordinary things, having the good health and energy to be able to walk in the rain, feel precious to me now. For years, whilst making the best of the circumstances in which I found myself, I couldn’t help longing at times for normal and ordinary as my body, mind and spirit went through apparently endless bouts of turbulence. My five year odyssey in the underworld of burnout and retreat, which some of you will have read about in the first two issues of this column, now feels as though it is coming to an end. Quite suddenly, in recent weeks, my energy has sprung back and various unpleasant symptoms have largely gone. Yes, order seems to have returned. I celebrate that, and give thanks daily. However – having survived a prolonged period of chaos where most of my familiar landscapes simply disappeared and the usual strategies for managing life ceased to be of any use – a few things are much, much clearer than they ever were before. Someone observed that life should be lived forwards, but can only be understood backwards. How right they were! One of the many advantages of growing older is that we have more life to look back on. Surviving until middle age and beyond – something our remote ancestors rarely did – offers us an opportunity fully to understand and accept the essential precariousness of the human condition. With this acceptance can come a greater degree of letting-go, and consequent inner peace, than is possible in youth. Pema Chodron’s “When things fall apart”, Jack Kornfield’s “After the ecstasy, the laundry”, (see Personal Book Reviews page for review of this great book) and Bo Lozoff’s “It’s a great life – it just takes practice”. In essence, the Buddhist view is that suffering is caused by wishing for things to be other than they are. I found reference to this simple, penetrating piece of wisdom – prominently displayed in our kitchen – bracingly therapeutic, especially at times when self-pity threatened to take me over. Life requires both chaos and order. With chaos alone, nothing could take form. Order by itself shuts down creativity and ultimately life itself. Chaos and order interpenetrate at every level from the most trivial to the most profound. Most of us who are at all computer-literate have at least once had the experience, early on, of pressing the wrong key or clicking the wrong box – sending our beautifully ordered and pleasing words which we haven’t backed up, into the void. And I know of hillwalkers who, slipping in the wrong place, fell to their deaths throwing loved ones’ lives into chaos in seconds. Buddhism advises us to hold very lightly to order, knowing it can turn at a blink to chaos; and to walk into chaos, regarding it as ‘very good news’ in the challenging words of renowned teacher Chogyam Trungpa. Clinging to outdated structures whilst the storms of life are tearing down everything familiar, usually doesn’t work. ‘Leaning into the sharp points’, trying to face and learn from upheaval, is a more fruitful strategy. But its rewards may take time to become evident, and it can be very hard to find the trust that new order will eventually emerge. Looking at the bigger picture, it’s also wise to remember that the scientific materialism which has come to dominate our view of life is very recent – a shallow surface layer of a couple of hundred years or so. For many milennia, at every stage of cultural and religious evolution, human beings across the world have perceived the whole of life as sacred, saturated with meaning. Our distant ancestors realised that humankind could not survive alone. In coping with the often brutal buffetings of life they needed one another, and connection with the divine spirit which vitiates all creatures. Communal social and religious rituals were a vital tool in affirming connection with a greater Order. Despite the unprecedented materialism and self-obsession of our age, which seems to be bringing humanity increased levels of disorder and unhappiness, as a species we remain ‘wired for God’.